It has been said that global missions is a very simple endeavor: All that is needed is for a man to be called of God, sent to the place where God has called him, and given the right tools with which to work. There are countless indigenous missionaries throughout the world who are laboring faithfully in the places where God has sent them, but oftentimes they are greatly hindered by the lack of financial and/or ministry resources. In the Majority World (also called, “Third World”), where most laborers buy food with the income that they have earned that day, many indigenous missionaries have little or no support from the churches they pastor. They must therefore devote a large portion of their time and strength to labor outside of the ministry in order to support their families. As a result of the pastor’s limited time for studying, shepherding, and evangelizing, the churches often suffer. 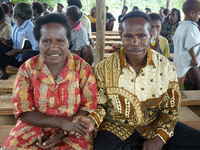 HeartCry missionary Sib M. together with his family. HeartCry missionary Sarvajit G. with his wife. Missionary Stefan Gae has dedicated his life to teaching the Bible to children. Vladimir R. (red shirt) teaching the Bible in a church member's home. Ivan Tassara with his wife outside of the church building in Sullana, Peru.